Bringing up copyright around authors can be a bit like opening Pandora’s Box, but let’s have a go, shall we? After all, a renown scholar, author, and lawyer Leslie Klinger has just sued an author’s estate on whether a particular character is in the public domain. The character in question? Arthur Conan Doyle’s famous detective, Sherlock Holmes. Now before we get all defensive on one side or the other, fan fiction VS. original creators, let’s follow the rights trail. When Conan Doyle died in 1930, he left his literary estate to his three children, Denis, Adrian, and Jean. Denis did quite a bit with the rights before he died, and then Adrian took over, but after that it gets tricky. The rights bounced around a bit after Denis’ widow, Nina, had some financial trouble and lost them to the bank. For about ten years, the rights were held by non-family parties. In the early 1980s, however, the UK put Sherlock & Co., into the public domain, and the US gave preference to family heirs like Jean to reclaim copyrights, and Jean did just that. 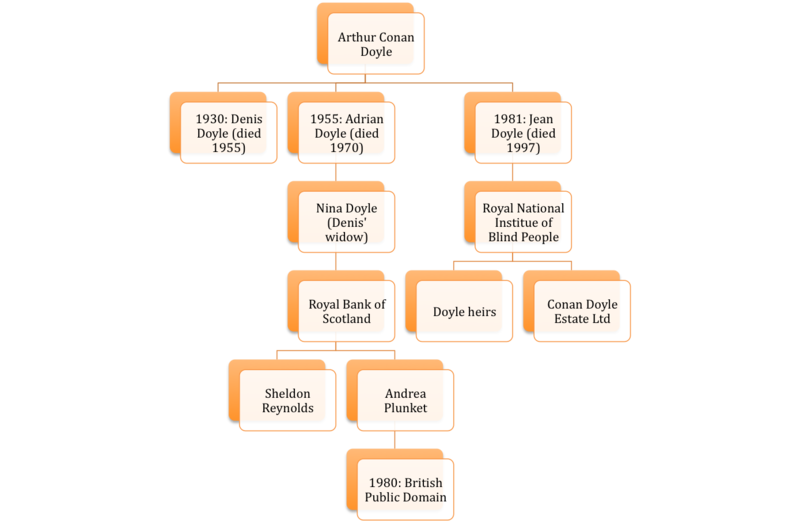 She had some fun with the rights, allowed some different interpretations like Young Sherlock Holmes, and then bequeathed the rights to the Royal National Institute of Blind People, who then sold it back to Conan Doyle cousins (Conan Doyle Estate, Ltd.). So what, exactly, is the Conan Doyle Estate managing now? US rights to 10 stories from The Case-Book of Sherlock Holmes. Everything else was published prior to 1923, so Conan Doyle’s copyrights have expired, leaving the content in the public domain. Now, I haven’t read The Case-Book, but from reading The Adventures and The Memoirs, which are free in the public domain, I have a firm grasp of the characters Sherlock Holmes and Dr. John Watson. Klinger is compiling a collection of Sherlock stories, inspired by Conan Doyle’s originals. The Estate wants a cut, even though Klinger’s collection excludes any details from The Case-Book. I make a point to stand up for authors in difficult legal situations, and it’s clear that the author to defend in this case is Klinger. Conan Doyle and his heirs had years of fun and profit from the Sherlock Holmes mystery stories, and even Klinger is willingly paying the estate for use of the stories that they still control. But when 50 other stories are sitting in the public domain, inspiring fan fiction and other creative works, it’s clear that the spirit of the Holmes’ character is free. Klinger filed his suit last week, and it seems like he’s the right man for the job. In a broader copyright sense, most authors want their works protected so that they get a piece of the pie when someone reads a copy of their book, decides to make a movie based on the book, or a little figurine of a character. When websites try to distribute content for free, or someone else lays claim to the story and tries to publish it under their name, copyright laws allow the author or their representatives to swoop in and stop those pirates and plagiarizers. And sometimes royalties keep coming in after the author’s death, giving a little monetary boost to kids and grandkids. But from that messy chart up there, you can see why eventually, copyrights must expire, stories must become a part of our general culture, and characters must become free.